2019 Baseball/Softball Sourcebook 30 www.SportsEventsMagazine.com Lgst. # Contig. Fields # of Fields Youth H.S. College Lgst. Seating Cap. Bleacher Stadium Dist. Between 2 Farthest Fields (mi.) 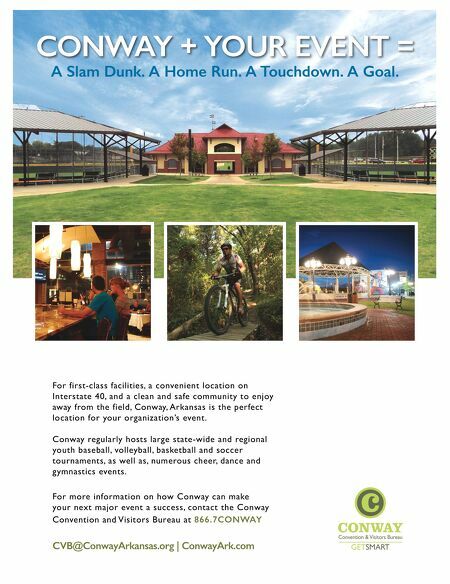 # of Metro Area Rooms Map Location # of Fields Lighted Sport Destination South • Florida t 800-634-9443 • LouisianaNorthshore.com/sports Plan your tournament in St. Tammany Parish, an hour from New Orleans, the Mississippi Gulf Coast and Baton Rouge, and it's sure to be a home run. World-class facilities are strategically situated less than 30 minutes from each other and include Pelican Park, Coquille, Slidell Bantam Baseball Complex and more. With over 3,000 hotel rooms, family-friendly attractions and fun, group-friendly restaurants, you're sure to be a winner. Call our experienced sales team for personalized service. 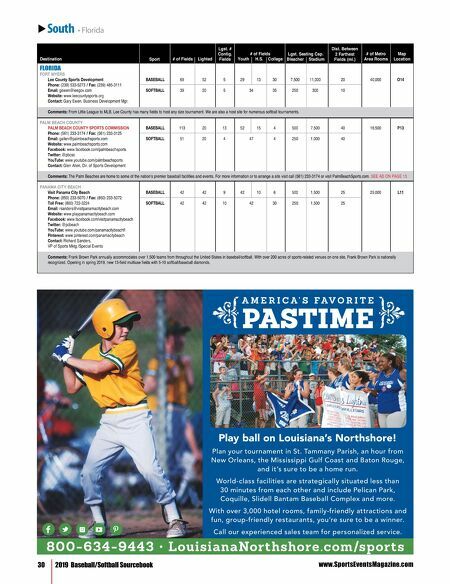 Play ball on Louisiana's Northshore! A M E R I C A ' S F A V O R I T E PASTIME A M E R I C A ' S F A V O R I T E PASTIME FLORIDA FORT MYERS Lee County Sports Development BASEBALL 69 52 5 29 13 30 7,500 11,000 20 40,000 O14 Phone: (239) 533-5273 / Fax: (239) 485-3111 Email: gewen@leegov.com SOFTBALL 39 20 5 34 35 250 300 10 Website: www.leecountysports.org Contact: Gary Ewen, Business Development Mgr. Comments: From Little League to MLB, Lee County has many fields to host any size tournament. We are also a host site for numerous softball tournaments. PALM BEACH COUNTY PALM BEACH COUNTY SPORTS COMMISSION BASEBALL 113 20 13 52 15 4 500 7,500 40 16,500 P13 Phone: (561) 233-3174 / Fax: (561) 233-3125 Email: gallen@palmbeachsports.com SOFTBALL 51 20 4 47 4 250 1,000 40 Website: www.palmbeachsports.com Facebook: www.facebook.com/palmbeachsports Twitter: @pbcsc YouTube: www.youtube.com/palmbeachsports Contact: Glen Allen, Dir. of Sports Development Comments: The Palm Beaches are home to some of the nation's premier baseball facilities and events. For more information or to arrange a site visit call (561) 233-3174 or visit PalmBeachSports.com. SEE AD ON PAGE 13 PANAMA CITY BEACH Visit Panama City Beach BASEBALL 42 42 9 42 10 6 500 1,500 25 25,000 L11 Phone: (850) 233-5070 / Fax: (850) 233-5072 Toll Free: (800) 722-3224 SOFTBALL 42 42 10 42 30 250 1,500 25 Email: rsanders@visitpanamacitybeach.com Website: www.playpanamacitybeach.com Facebook: www.facebook.com/visitpanamacitybeach Twitter: @pcbeach YouTube: www.youtube.com/panamacitybeachfl Pinterest: www.pinterest.com/panamacitybeach Contact: Richard Sanders, VP of Sports Mktg./Special Events Comments: Frank Brown Park annually accommodates over 1,500 teams from throughout the United States in baseball/softball. With over 200 acres of sports-related venues on one site, Frank Brown Park is nationally recognized. Opening in spring 2019, new 13-field multiuse fields with 5-10 softball/baseball diamonds.